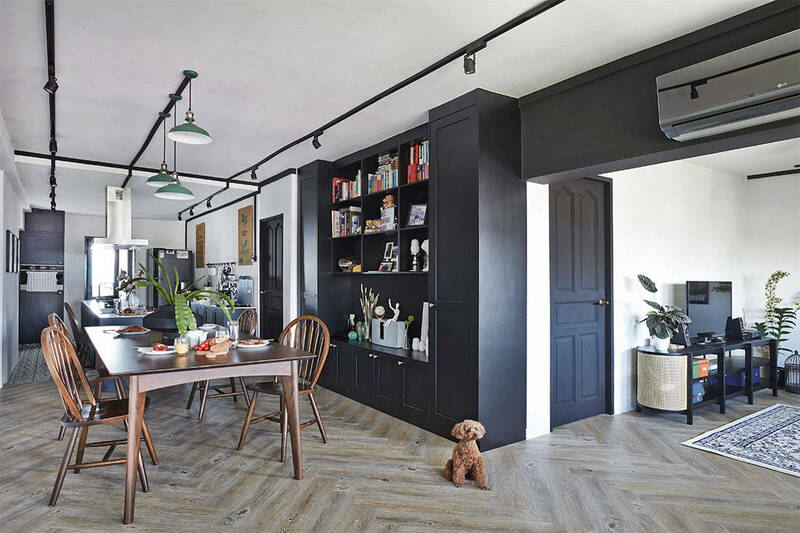 Meticulous planning formed a big part of this home’s renovation, and this falls in line with the homeowners’ desire for a stylish yet highly functional family residence. 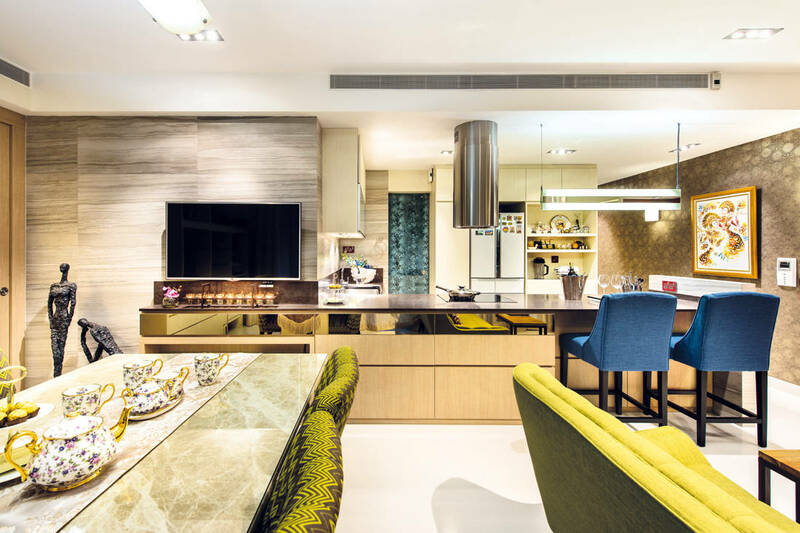 In this project, a cohesive design flow and colour scheme help prevent visual overload, especially with the new open-concept kitchen and huge island dominating the communal living space. 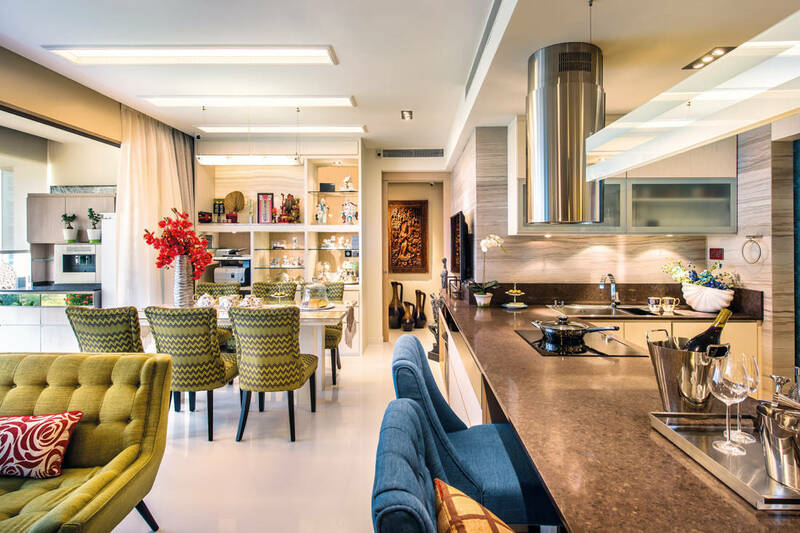 Bespoke measures such as the custom-built furnishings and doors imbue the communal zones with an aesthetically pleasing touch. The wall that originally enclosed the kitchen has been taken down to give way for an open-plan layout and to accommodate a large kitchen island. With quartz countertops from Caesarstone and Japan-imported laminates utilised for the kitchen counters, luxury is brought to the forefront. “The kitchen, sink, cooker and additional storage have been repositioned for practicality, convenience and comfort,” add the designers. Besides outfitting the space with custom carpentry, the designers at Ultimate Interior Creation took into account the number of electrical points and their positions to ensure even distribution of lighting, which they admitted was one of the most challenging tasks they had to undertake in this project. While a modern luxe theme defines this spacious unit, the practical-minded Japanese homeowners wanted their home to look good and work just as well. To fulfil this two-pronged design brief, the designers worked mainly with a material palette brimming with opulence. “We proposed luxurious details such as imported fabrics and wall finishes, as well as leather, marble and onyx stone,” reveal the designers. An L-shaped concrete bay window used to flank the master bedroom, but the designers decided to maximise its usage further. Custom carpentry now dominates the lower third of the bay window which serves many functions: additional wardrobe space, dressing table, side table and seating area. 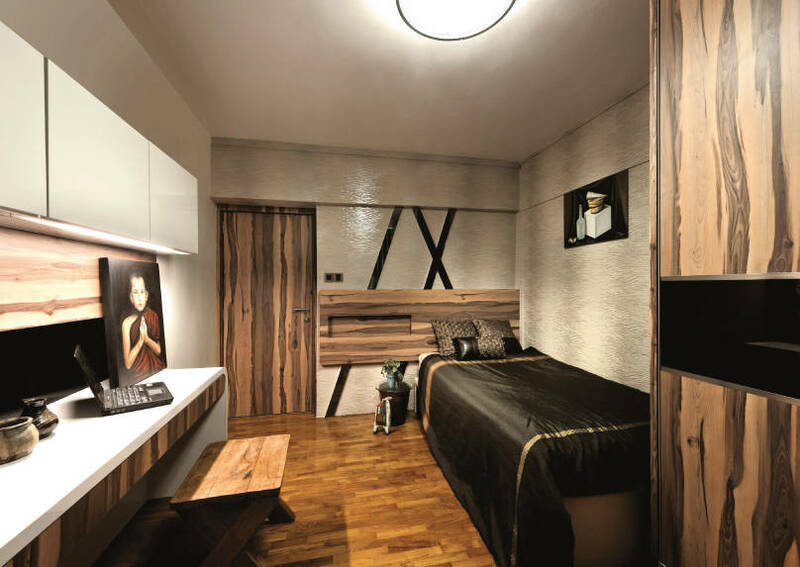 Rich textures like marble and Japan-imported laminates for the carpentry works lend the space a hotel-worthy appeal. 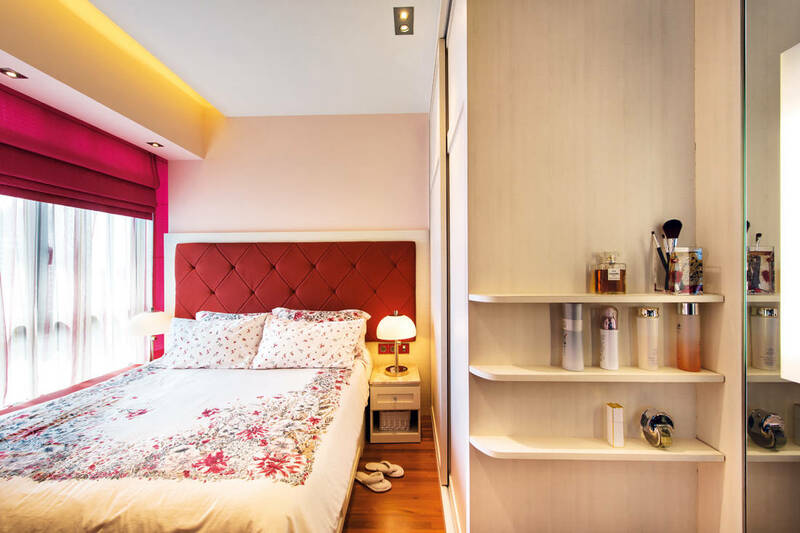 The designers explain: “We wanted to fully utilise this space as it’s the common bedroom.” By working precisely with the dimensions of the room, they created a custom bed complete with headboard, wardrobe and plenty of storage compartments. At the centre of this bedroom-turned-study is a customised workstation for two. This is a refreshing departure from typical study desks that are usually placed against the wall. The designers also made full use of the bay window by installing custom cabinets to keep books and papers away. 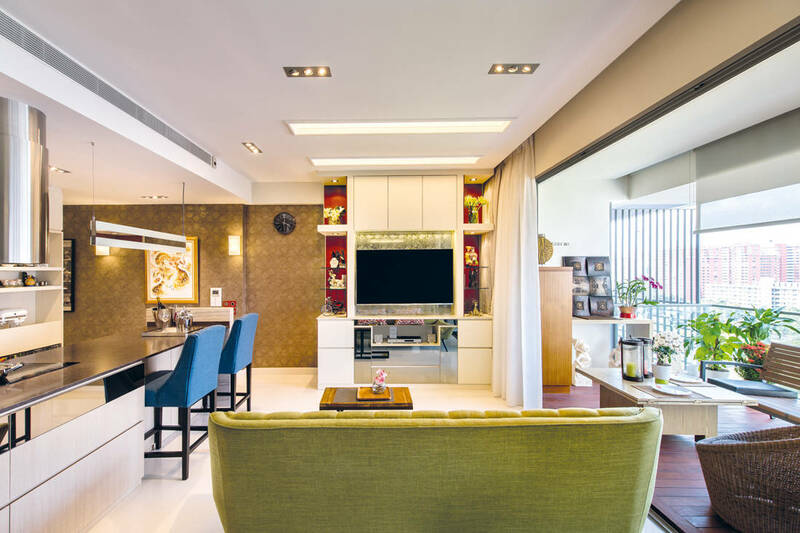 “Natural brightness was maintained in every corner of the home,” say the designers. This is especially evident in the living area which resides next to the balcony. Meanwhile, leather wall covering and a marble-topped TV console add to the luxe factor in the living room. Here, every detail is meticulously planned to the homewoners’ exacting standards, from the space planning to material selection and colour palette. While the unit itself receives adequate amount of daylight, the designers ensured that direct and indirect lighting would work in harmony to establish a cosy mood in the evenings. This creates an inviting setting for the homeowners – a married couple with a child – to enjoy familial bonding in the communal zones.